Today's cities are marvels of engineering, full of soaring skyscrapers and buildings that seem to defy gravity. But many of the architectural innovations that got us here are ancient. Here is a pictorial history of the world's greatest breakthroughs in building and city design. The Ħal Saflieni Hypogeum (Ipoġew) of Paola, Malta. It's a carved sanctuary, and later became a necropolis. It's the world's only known prehistoric underground temple, built between 3000-2500 BC. The remains of more than 7,000 people have been found here. The greatest architectural achievement of ancient times: the Great Pyramid of Giza, the oldest and the only intact of the Seven Wonders of the Ancient World. It was the tallest structure for almost four millennia with its height of 481 ft (146.5 m), built around 2560 BCE. The oldest building with huge building blocks, maybe with the largest ones ever: the Jupiter temple of Baalbek, Lebanon. Three blocks weigh in at 800 tons each, but there are some smaller ones (350 tons), too. Not far from the temple there is the 65 ft (20 m) long Stone of the Pregnant Woman (or Stone of South), which weighs 1,000 tons, and another, recently discovered monolith with the weight of 1,242 t.
The Assyrian Jerwan Aqueduct, built between 703 and 688 BC. It used fully waterproof concrete, an incredible innovation that allowed people to build massive structures in water. Walls from an ancient Inca city, precisely cut with stone, copper and bronze tools and perfectly fitted without mortar. Rounded arches were invented by the Mesopotamians 4,000 years ago, but were popularized by ancient Romans, who relied heavily on the arch in a lot of their monumental architecture. 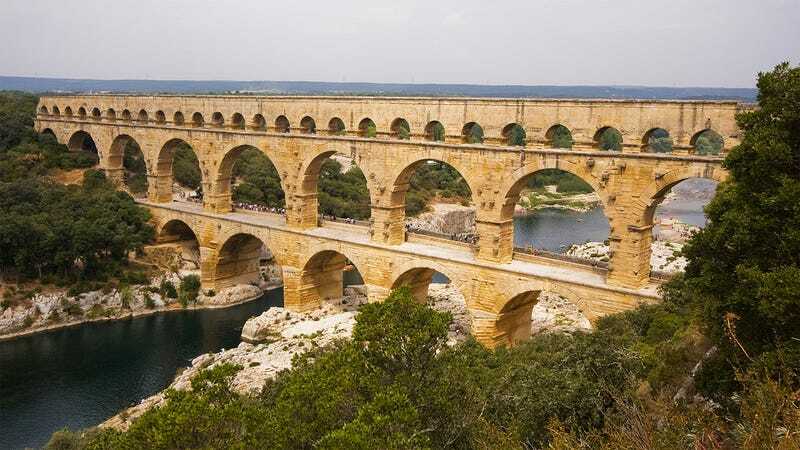 The best-known examples are aqueducts like the 31 mi (50 km) long Pont du Gard in France, which carried water from a spring to Nemausus (now known as Nîmes), built between 40 and 60 AD. The load-bearing arch has been widely used and transformed into many different shapes throughout the past 2,000 years. Glass windows, first used by the Ancient Romans in Alexandria around 100 AD. Concrete domes, invented by the Ancient Romans, first used in the Temple of Mercury (built during the age of Augustus, between 27 BC and 14 AD). The most well-known example is the Pantheon's dome, the world's largest unreinforced concrete dome since its completion in 126 AD. Ditherington Flax Mill, the first iron-framed building in the world, "the grandfather of skyscrapers", constructed by Charles Bage, completed in 1797, Shrewsbury, England. The first wire-cable suspension bridge, the 407 ft (124 m) long Spider Bridge at Falls of Schuylkill in Philadelphia, Pennsylvania, constructed by Erskine Hazard & Josiah White, opened in 1816. It was only a temporary structure, stood only for a year after its completion. The first major glass building in the world, the Great Conservatory in Chatsworth, England, designed by Joseph Paxton, constructed between 1836 and 1840. It was 227 ft (69.2 m) long, 123 ft (37.5 m) wide and 67 ft (20.4 m) high. The glass house wash't heated during WWI, and the plants died. The place was demolished in the early 1920s. The 138 ft (42 m) high Home Insurance Building in Chicago, the first skyscraper and the first to use structural steel in its frame, designed by William Le Baron Jenney, completed in 1884. Two floors were added to the original ten in 1891. The building was demolished forty years later to make way for the Field Building, now known as the LaSalle Bank Building. The world's first reinforced concrete skyscraper, the 15-story Ingalls Building in Cincinnati, Ohio, designed by Elzner & Anderson and built in 1903. Floating slab, used in Villa Savoye by Le Corbusier, stands in the outskirts of Paris, France, built in 1931. The first building heated primarily by solar energy: the MIT Solar House #1, built in 1939 on the MIT campus, designed by a team led by Hoyt C. Hottel. The first commercial building with the system was the Solar Building in Albuquerque, New Mexico, built in 1956, designed by Frank Bridgers and Donald Paxton. The structure consists of 585 components printed in 10,800 hours.